The Wireless Broadband Alliance (WBA) published findings from a survey on the Wi-Fi hotspot market, conducted by Maravedis-Rethink. 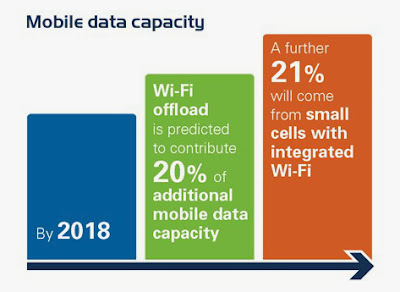 The global market study revealed that mobile network operators expect 22 percenet of all additional data capacity added during 2013-2014 to come from Wi-Fi offload. Data offload is deemed to be very important to mobile service providers -- accounting for an average of 20 percent of data traffic, up to 80 percent in densely populated areas such as transport hubs and cafes. Within homes and businesses offload levels are 50 to 60 percent. The survey also highlighted that 51 percent of respondents -- 56 percent of network operators -- are more confident about investing in Wi-Fi to supplement cellular than they had been a year earlier. Renewed confidence can be attributed to increased hotspot deployments and more ambitious business plans announced by some mobile carriers -- as well as the vast improvements made to Wi-Fi through enhanced roaming agreements and WBA initiatives such as Next Generation Hotspot (NGH). Maravedis-Rethink forecasts a steady annual increase in hotspots deployed from 5.2 million in 2012 to 10.5 million in 2018. Of the hotspot owners, 27 respondents have networks of over 1,000 locations and six have more than one million. By contrast, almost 10 percent of those supporting roaming have access to networks of over one million locations. Operators are expanding the access they provide rapidly via roaming agreements and as the process becomes simplified and standardized, this trend will continue to accelerate. Monetization strategies also came up as an important consideration with the most significant being Wi-Fi offload, closely followed by location-based services such as targeted marketing, and enterprise applications. With regards to NGH deployments, 78 percent of those planning to launch an NGH network will do so by end of 2015. Boingo Wireless recently led the way by launching the world’s first commercial Next Generation Hotspot Wi-Fi network at Chicago O’Hare Airport. Early trials and deployments like this will provide valuable test beds of real world performance and demonstrate the power of this technology. Over half the respondents stated that the most pressing driver for NGH investment was to increase offload from cellular networks -- closely followed by the need to increase customer satisfaction, increase revenues and facilitate seamless roaming. "Public Wi-Fi is steadily maturing and is now being embraced by an ever growing number of operators. NGH brings significant improvements in terms of quality of service and ease of use, bringing a cellular experience to Wi-Fi," said Shrikant Shenwai, CEO of the WBA. “This research shows an increasingly positive attitude towards public Wi-Fi which is largely thanks to the strength of the ecosystem and the technical and commercial progress to make NGH deployments possible.